The last time I saw Randy Wicks, he was making faces at my little boy. It was a Friday afternoon. We were leaving that evening for a weekend camping trip, and my wife Erin had gotten off work early to pack. She brought Luc by the office to say hi, and Randy, as usual, cooed over the little guy, who wasn't quite a year old yet. Luc giggled at Randy, but not for the same reason most people did. Most people giggled because of what Randy drew as The Signal's cartoonist. Luc giggled at him because he made a funny face. Anyway, Erin and Luc left, and I went about the business of getting the weekend opinion pages together. We then left for a scheduled two-night trip to Buellton. The next day, after we'd been away from the campsite to shop, we returned to find a note pinned to one of the tent-trailers. The note said to call the office ASAP, and when I did, John Boston broke it to me: Randy had died that morning -- one year ago today. It was a heart attack. He was just 41. We broke camp faster than ever and hurried back to the office. We called Mom on the cellular phone and asked her to call my grandmother and tell her the bad news. Randy had been friends with my grandfather, who died a couple of years earlier. A Wicks-autographed cartoon -- signed, "To Big Joe" -- still hangs on the wall at Nana's house. There was a candlelight vigil at the office that night, and in some ways a vigil has been kept ever since. Some members of our staff still choke up when Randy's name comes up in conversation. He was part of the family. A few days later, Will Fleet and I completed the grim task of cleaning out Randy's office. That office contained all the vital clues about this man, and what made him tick. Some of his most prized possessions were there, right down to his Chicago Cubs pennant. When we were done, we locked the office tight. It stayed that way for, oh, a good six months. Randy's personalized license plate said, "PSN PEN," and indeed, when he targeted a politician -- especially a Republican -- that pen could sting. But his cartoons almost always contained some Bactine, too, to take the sting away. "Poison Pen" belies his kindness. He led kids on tours of The Signal. He would draw cartoons for them and always included a lesson on the First Amendment. He spent untold hours drawing cartoons for invitations, programs and fliers for one community do-good organization or another. He was an incredible observer of human behavior, and a co-worker who was down in the dumps would inevitably get an understanding pat on the back from Randy, followed by the most sincere, sympathetic query: Are you OK? Is there anything I can do? Not long after he died, we decided a lasting tribute to Randy was in order, and as a result we formed the SCV Press Club to facilitate the tribute. We planned a big fund-raiser -- the SCV Newsmaker Awards -- to establish a scholarship program in Randy's memory. The event was a huge hit, and in June we awarded two $1,500 scholarships to a pair of outstanding local students. The annual Randy Wicks Memorial Scholarship will become that well-deserved, lasting tribute. We couldn't keep his office locked up forever, as much as some of us would have liked to. My office had been adjacent, and we're planning some major equipment changes and furniture moving in the department, so we knocked down the walls of my office -- it had been an add-on created by a previous editor -- and I moved into Randy's. It's the only work space in the Editorial Department that has a window. That Randy, he always had the prime spot, the best vantage point from which to stare at the sky, the car dealership across the street and the trees and hills behind it as he pondered the world's events and conjured up a cartoon idea. It was unsettling, moving into that office. Randy was an icon, a community legend. His work was magic. Who was I to occupy that space? Hell, I'm struggling just to hack my way through a column that only describes the magic, much less make it. The nerve. Now, it's been a year since Randy died. And here I am in my office -- his office -- staring out at a cloudless sky, wondering what cartoon magic he would have created today if he were sitting here. There are mementos of Randy in here. There's his football, bearing the famous Wicks autograph. Whenever Luc comes to the office, he looks for that ball, and we play a toddler version of "catch" in the newsroom. 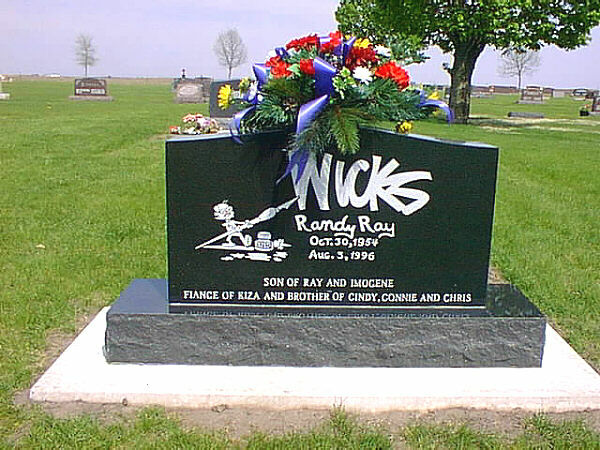 And there's Randy's baseball glove, also bearing the "Wicks" signature. And a tie his family gave me after he died. And Randy's wonderful, wonderful puppet of Ronald Reagan wearing boxing gloves. When you pull a trigger inside the puppet, Reagan punches himself in the face. Other reminders of Randy are being readied for placement on a wall near The Signal's front desk: some of his many awards, copies of cartoons, commendations from politicians, his plaque commemorating fifteen years of service to the paper, and the flag that was flown over the U.S. Capitol in his honor after he died. There's another memento from Randy at my house, hanging on the wall of Luc's room. It's a framed cartoon Randy drew the day Luc was born. It depicts a nurse showing the new baby to "Mr. Whyte," and the baby has Mickey Mouse ears -- a nod to my fondness for all things Disney. The only parts of "Mr. Whyte" that show in the cartoon are his feet, as he has fainted upon seeing the Mouse-eared "baby." Luc won't remember knowing Randy, but he'll always have that cartoon. And years from now, when Luc asks where that drawing came from, I'll say, "Son, it came from your friend Randy. And let me tell you, he was a whole lot more than just a funny face. . . ."